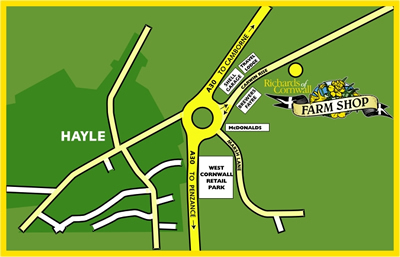 We are situated just off the main Hayle Roundabout at Loggans Moor near the new West Cornwall Retail Park. From the roundabout head towards Connor Downs, the Shell Garage will be on your left and Mcdonalds will be on your right. We are about 200 metres along this road on the right-look for the cottage by the road. Plenty of free parking and wheel chair freindly.